Click HERE for the Liturgical Ministries page. Click HERE for the Catechetical Ministries for Children page. Click HERE for the Catechetical Ministries for Adults page. Blessed Sacrament 55+ Seniors – The 55+ Seniors group meets each month on the fourth Monday (times vary) for social interaction. Call the parish office for information. Board of Total Catholic Education – This is an education advisory board for our school and parish. Interest in this board should be expressed to the pastor. Christmas Giving Tree Project – Volunteers are needed prior to Advent to cut out paper ornaments, write on them the requests given us by area social service agencies, and decorate the trees to be placed near the church entrances. Volunteers also gather donations as they arrive, move them to a safe location on the parish grounds, sort, and deliver them to the local agencies. This is a large project, requiring the assistance of many volunteers from mid November to mid December. Contact: Bridget France (426-5818). Family Life: Coffee & Donuts – Serve coffee and donuts in the Undercroft after the 9:30 and 11:30 a.m. 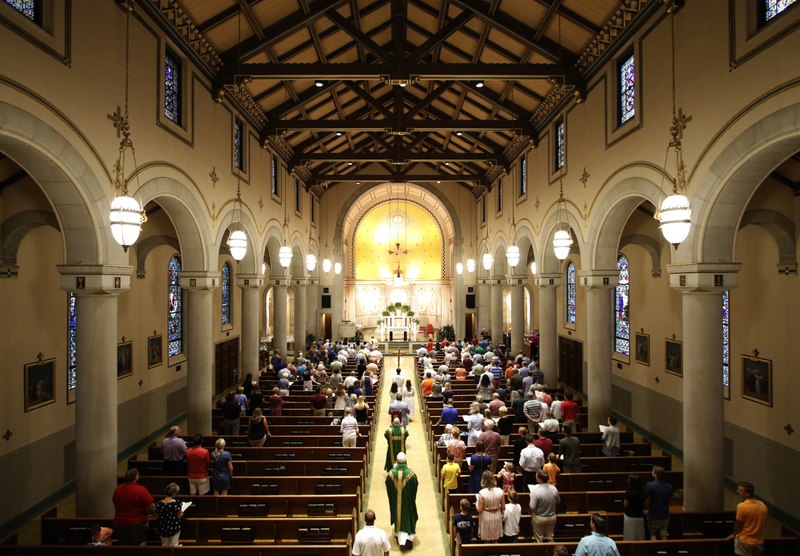 Masses on Sundays, except during the summer. Volunteers choose from openings in Sign-up Genius. Contact: Kevin Esmeier (620-3632 or kesmeier@outlook.com). Family Promise – This ministry serves homeless families in NKY. Blessed Sacrament provides volunteers to prepare and serve meals, do housekeeping, act as evening activity hosts, van drivers and overnight hosts at St. Agnes Church. We serve one day approximately every 10 weeks. Even children can help by playing games with Family Promise guest children. If interested in serving homeless families, please contact Marianne Meyer (331-4302 ext. 10). Finance Committee – Work with the pastor in an advisory capacity on financial issues of the parish. Interest in this committee should be expressed to the pastor. Gift of the Month – Each month, we collect items needed by one of the local social service agencies. The Gift of the Month is announced in the parish bulletin, and donations are placed in blue bins near the church doors. At the end of each month, someone needs to pick up the donations from the Parish Office and deliver them to the appropriate agency. Most average size cars are large enough; vans and trucks aren’t needed. If you’d like to be added to the driver list, contact the Parish Office. Grounds & Facilities – Help with upkeep of the gardens, grounds, and facilities is needed April through November. One crew volunteers each Friday morning during the warm months. Coming soon: Individuals, families, or small groups may “adopt a plot” and maintain one garden area on the campus at a time of their choosing. Contact: Jay Thamann (jaythamann@yahoo.com). Home-bound – Call the Parish Office to be added to the volunteer call list. Chores/Visits – Visit with parishioners who are home-bound. Just chat or help with household chores. Meals – Prepare and deliver a meal for a parishioner/family that is in a crisis situation or prepare meals on a regular scheduled rotation for a parishioner who is home-bound. Transportation – Drive a parishioner who is home-bound to the grocery, doctor, etc. You can specify which days/times you are available for this ministry. Housing Opportunities of Northern Kentucky (HONK) – HONK reclaims dilapidated houses, assists the working poor with credit and budget counseling, and provides lease-purchase opportunities that help families afford homes, providing hope, reversing neighborhood blight, and encouraging economic stability. Parishioners from Blessed Sacrament meet on the second Saturday morning of each month at a designated site to clean, repair, paint, and restore houses as part of this community effort. Contact Rosanne Thomas in the Formation Office to have your name placed on the e-mail list for monthly information and locations. Urban Mission – BSC joins with Housing Opportunities of Northern KY (HONK) to develop an annual week-long Urban Mission Project of rehabbing a damaged or neglected house into a home for a family in need. HONK works with families who just need a little help to achieve the American Dream of owning a home. All skill levels are needed, and even middle schoolers can help with adult supervision. Participants meet for a light breakfast and prayer each morning before setting out. Contact: Jay Thamann (jaythamann@yahoo.com). Office Help: Mailings – Help get large mailings out to the post office. Folding, stuffing, putting on address labels, etc., are all done in the Blees Center on an as-needed basis. Contact the Parish Office to be put on the call list. Parish Pastoral Council – This council acts as an advisory committee to the pastor in any area requested by him. Interest in this council should be expressed to the pastor. Scouting – We have Brownies and Cub Scouts. Older scouts are part of a regional program that meets elsewhere. Girls interested in learning more about scouting may contact Tiffany Salzman (331-7979). Boys interested in learning more about scouting may contact Patrick Brown (815-8644). Eucharistic Exposition – Wednesdays from 10:00 a.m. to Benediction at 6:15 p.m. Volunteers are needed to make sure someone is present at all times. Contact: Mary Anne Gronotte (341-6214). Ministry of Praise – This is a group of individuals, either over the age of 55 or home-bound, who minister to the community by making a commitment to pray for the needs of the parish every day. Members receive the monthly Reflections mailing to assist them in their prayers. Contact the parish office if interested in participating. Click HERE for the current issue of Reflections. Mustard Seed Community – a Charismatic Prayer Group – This diocesan group meets monthly in the BSC Parish Center on the third Tuesday, 7:00 – 8:45 p.m. Contact: Blaine Comfort (578-0133). Prayer Hotline – Emergency prayer requests are sent via email to parishioners who agree to pray for these intentions. Call the Parish Office to add your intentions or to be included in the email list. Rosary – The rosary is prayed at 9:30 a.m. before every 10 a.m. weekday Mass, unless there is a funeral. Rosary is also prayed on Sunday at 10:45 a.m. in church. During the months of May and October, there is an evening rosary on the lawn. See bulletin for time and location. Respect Life – This group of concerned parishioners helps promote pro-life awareness in the parish. They set up the annual white cross display, sponsor youth at the March for Life, participate in 40 Days for Life, and distribute pro-life bumper stickers, etc. They meet monthly on the second Monday. Contact: Kathy Thamann (jaythamann@yahoo.com) or Pat Bethell (341-8405). St. Vincent de Paul – The Vincentians grow closer to God through service to the poor. They meet monthly to pray and coordinate their outreach activities. Among their many services to the community, they maintain the food pantry on site, and members also offer their services on a rotating basis as contacts to interview and provide support to needy individuals within our area who contact the district office of St. Vincent de Paul. Contact: Dave Kleier (344-9055). Santa Sacks for McKee – Gift bags with gift suggestions and packing instructions are made available in church in late November. Parishioners are asked to take a bag, fill it for a child in our twinning community in McKee, KY, and return it to the church. Volunteers are needed to collect the bags from the back of church and move them to a safe location on the parish grounds until they are ready to be delivered to McKee in early December. Contact: Jay and Kathy Thamann (jaythamann@yahoo.com).